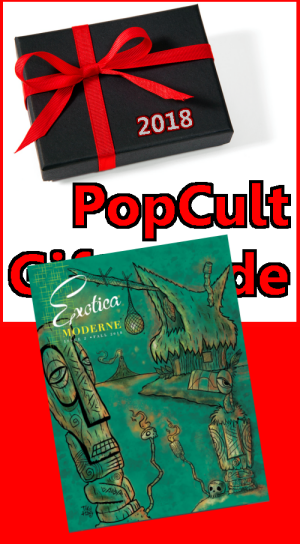 Our next pick in The 2018 PopCult Gift Guide is a new magazine dedicated to Tiki Culture and its related ephemera, Exotica Moderne. 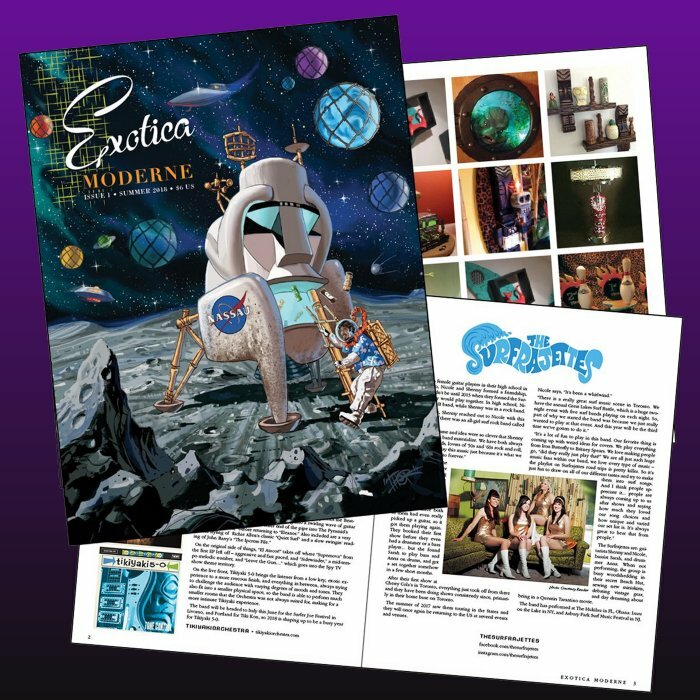 Exotica Moderne is a quarterly publication showcasing the new tiki and lowbrow art and artists, exotic cocktails, kustom kulture, music and more. Focusing on where these genres have been and where they are heading, Exotica Moderne features emerging artists as well as those spearheading these movements. Where all of these subcultures meet and intersect, Exotica Moderne covers next wave of tiki and lowbrow art. Regular Features include: Tiki with Ray ; Cocktail Hour; Moving in Stereo; and Private Oasis. There have been two issues published so far, and they can be ordered directly from the magazine’s publisher, House of Tabu, who also offer some cool Mugs and other items like shot glasses and memberships in The Order of The Golden Fez. Determined not to fall into the trap that has ensnared some other Tiki magazines, Exotica Moderne does not offer subscriptions. You can sign up for their email list, and you will be notified when the new issue is available to order. It’s neater that way. Nothing beats being able to flip through a magazine and find great articles and cool graphics about stuff that just screams “COOL” at the top of its lungs. This is a great gift for the Tiki fan on your holiday shopping list who still reads paper magazines, and it’s cheap enough to be a stocking stuffer. You can order it HERE.